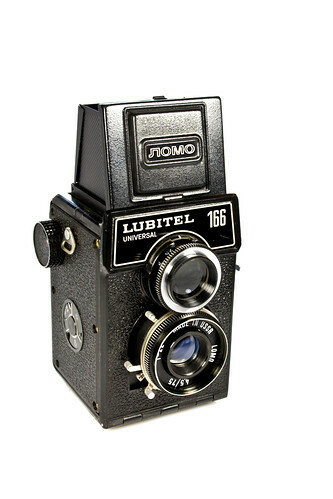 The Lubitel 166U was made by Lomo in Leningrad (now St. Petersburg), Russia. The Lubitel is the poor man's twin lens reflex camera. It is similar to the earlier Lubitel 166B but adds the option to mask the film gate to a smaller 6x4.5cm image format, yielding 16 exposures on a roll of 120 film. Being made of plastic, it is sometimes lumped into the toy camera category; but it has a 3-element glass lens, and other features like several apertures and shutter speeds. Although bright, the screen is really hard to focus. It has a ground circle in the center and a small magnifying glass to help with the task, but the results don't seem worth the effort. You are almost better off estimating the distance Holga-style. But all-in-all, it is capable of taking pretty sharp photos, and if you are willing to put up with its idiosyncrasies. This page was last edited on 5 March 2018, at 11:35.